I'm playing around with Wirecast right now, to see if I can use to to realise an idea for a project that I have, and I'm running into very high CPU load situations. I'm using a 2018 MacBook Pro, the base model of the 4 thundebolt/touchbar variant. The load is causing frame rate to drop and the resulting footage choppy, not to mention cause my MBP fans to enter into spaceship lift-off mode. I was thinking about getting an eGPU to try and remedy this problem, and was wondering if anyone else here had experience with a MacBook Pro and eGPU with Wirecast. If not, does anyone have any theoretical knowledge about whether a eGPU should have any impact on the CPU load? My best guess is that Wirecast is using CPU cycles to render when some of this could be done with hardware rendering, but the integrated graphics on the MBP is puny, so it can't contribute much. Curious to hear your thoughts, I'm eager to get this project up and running. I don't think eGPU would have that much impact beyond a small number of features. Wirecast can use Apple H.264 encoder to lower CPU load but, with the exception of the iMac Pro, that's handled by the integrated GPU. The GPU does handle some things like Multi-Viewer Output though. Perhaps if you gave me a complete tech description including sources and settings, I can spot potential bottlenecks. Pablo Fuente We haven't tested eGPU support yet. You should be able to use Apple H.264 thought to lower your CPU use as that uses the integrated resources for hardware assisted encoding. CraigS Thanks a lot. I am considering buying an iMac Pro, any warnings I should be aware of? any suggested specs or baseline model with Vega 54 and 16mb ram will be fine? Thanks for all your work!! I forgot to add one thing, I believe (but I do have no knowledge to assure it) that outputting the macbook pro via 2 displays 4k is making things worse. I wonder if the egpu will help with that too. Pablo Fuente I'm using an iMacPro. I upgraded to the Vega64. 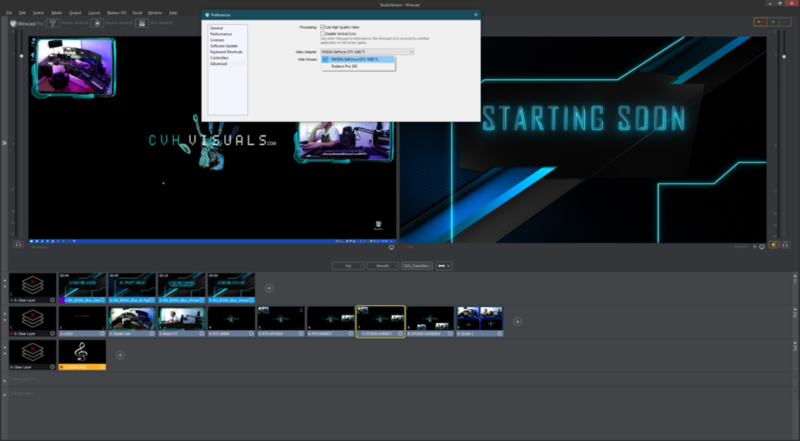 Wirecast uses the GPU to do Apple H.264 encoding. Normally that would require an "i" processor. outputting the macbook pro via 2 displays 4k is making things worse. I wonder if the egpu will help with that too. Running two large displays can stress the GPU resources. An integrated GPU might be stressed when using some Multi-Viewer Output settings. I'll check on eGPU support but not officially supported as of yet. CraigS Sorry to bother you again with this, but being such an investment, I prefer to be sure. So iMac Pro will work well, you prefer Vega64. Regarding the processor, will the Xeon 8 cores be enough?, what about the RAM?. Thanks!!! CraigS I do not use Multiviewer, so I presume that 2 larges displays are simply too much for a 2018 Macbookpro 13" with i7. My assumption is that heating is the issue. Pablo Fuente I wouldn't foresee a big problem for a basic two monitor setup but, again, depends on what the integrated GPU handles. I don't think heating should be an issue though. Pablo Fuente I'm using 8 Core and 32GB of RAM. but more of everything is generally better. It really depends on how hard you push the system. Sources, destination, other programs running, all have impact. My general recommendation is overbuy especially given Macs are not very expandable. Again it depends on several variables. CPU should not go over 60% otherwise it means you're taxing the system. I am using a 2018 15” MacBook Pro bootcamped to Win10 with an eGPU - Nvidia 1080ti. Pushing 2 - 4K monitors, one is for the GUI, one is multiview. You need to select the 1080ti card in the advanced settings. Streaming 9000mb NVENC 1080@60fps no problem. System stays around 25%-35% with complex feeds. (Several NDI feeds, SDI capture, audio, animated windows frames) all on one scene. You can use the MacBook monitor, but it will utilize the AMD card for it resource, which causes heat and fans. I disable the AMD device under Device manager, and the laptop stays cool. Christopher Van Hoose Interesting tips for an interesting config. Thanks for posting that. Anytime Craig. Here is a screen of the advanced setting for video adapter. I posted on another thread regarding the new macmini. A mac that does not have a dedicated graphics card, allows you to be able to hot plug the eGPU. On a mac with a dedicated graphics card, you will need to have the eGPU plugged in before boot. Also when looking for a eGPU, look for one that offers 4 lanes. I am using a Razer CoreV2. This is why the macs are the best for eGPUs because the thunderbolt 3 ports are also 4 lanes. Most windows laptops with thunderbolt 3 ports only offer 2 lanes. The macMini is a beast and actually has more processing power than the MBP, yet the MBP is only utilizing up to 45% system with most of my heavy projects. I opt use the MBP because of the one less item I have to plug in, the keyboard. Christopher Van Hoose Thanks for those insights. There are times when I've suggested to Windows users there's a good reason to buy a Mac and bootcamp it to run Windows 10. You've provided a good real-world example regarding the importance of the TB3 ports.